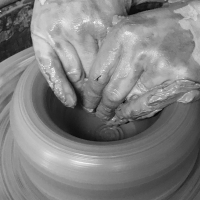 Markella has been involved in the art of clay for some twenty years and her classes accommodate beginners all the way through to advanced students. Classes are designed to the individual needs of each student and offer the ability to learn hand building, slab work, coil work and wheel work with all of the necessary steps to achieving a finished piece of art. My strength is in functional pottery.